I thought I'd share with you the cool Christmas gift I got this year. Miniature qomatiqs are pretty popular up here, from rudimentary pull toys to pieces of art. What makes this one stand out is the accessories. This qomatiq and iglutaq (the small shelter on top) are built just like the real life versions, complete with tarp wrapped cushioning inside. The grub box comes with a miniature Coleman 2 burner stove and a kerosene heater. Check out the detailing on the stove. I've included a penny in the shot for scale. The artist is Randy Olayuk, from here in Arctic Bay. I consider Adrian Arnauyumayuq to be the best carver in Arctic Bay right now. He is imaginative, and skilled, and a really nice guy. 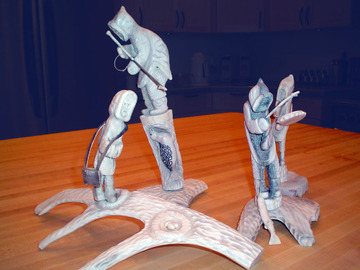 Here is one of his latest carvings, bought by one of our clients this morning. The Narwhal is about 18 inches long. Although the photo doesn't do the piece justice, you can see the life in this whale, unlike so many that are carved. I finally received my Sgian Dubh from the carver last night. You might recall the Sgian Dubh I had made for my brother-in-law, well here is mine. I had a heck of a time taking a picture with out washing out the ivory on the handle. On the obverse side is a carving of a polar bear (although I think it is upside down, or at least that's how it will appear when worn). As before the handle is carved from Narwhal Ivory and the pommel is 6000 year old bog oak from Speyside Scotland. It didn't quite look finished to me as the blade wasn't seated all that well in the handle so I added the piece of bog oak between the blade and the handle. The RCMP cap badge in the picture is going to eventually be my kilt pin. The tartan? MacKenzie Modern, the tartan my Grandpa wore when fighting overseas. I've mentioned before that I hope to go to France in April with my father for the 90th anniversary of the Battle of Vimy Ridge. I've long wanted to go to France and Flanders with my dad, and visit the places where my grandfather fought during the Great War. The 90th anniversary presents a good opportunity for a visit, and dad isn't getting any younger (while I am) so who knows how many more opportunities will present themselves while health isn't an issue. My grandfather fought with the 16th Canadian Scottish, and I thought to honour him that I'd get a kilt in his Regimental tartan (officially it was the Lennox, but only the pipers wore that, the men wore the MacKenzie Modern). When I had visiters from Scotland this summer I took the opportunity to quiz them on Highland wear, and part of the advice they gave me was to pay particular attention to the accessories, to make it my own, and make it quality. 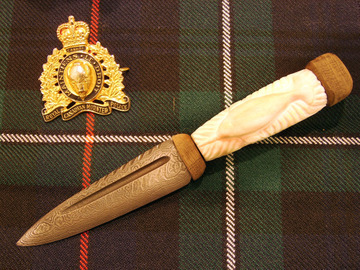 One of the items that forms part of Highland Dress is the Sgian Dubh (pronounced skeen doo). It literally means black knife in Gaelic and is a knife that tucks into the hose. When I thought about it I thought "what would be better than a Sgian Dubh with a carved handle from the Arctic". Dave, one of the qayaqers here thought that the ivory would be too light for the knife, and sent me some 6000 year old bog oak from Speyside to use as the pommel and add a little darkness to the knife. One of the best carvers in Arctic Bay, Adrian Arnamaumayuq, got married about three weeks back, and in exchange for baking his wedding cake, he agreed to carve me two handles for Sgian Dubhs. One Sgian Dubh is for my brother-in-law (Leah's sister Eunice's husband Ian) who hails from Scotland, and the other is mine. Tonight he brought over the first one, Ian's, and here are the pictures. The blade isn't fitted into the handle yet, hence the gap. 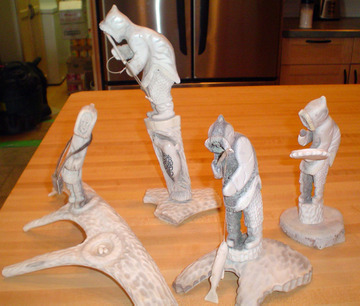 This is a series of carvings by Samo Issuqangituq of Arctic Bay (now living in Iqaluit). They are of a Seal Hunter, Drum Dancer, Fisherman, and a Woman Gathering Eggs. Amongst the first carvings I bought and my favourites, the photo doesn't do them justice. The detail on the char alone is exquisite. 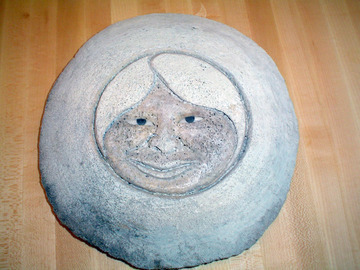 This is one of my favourite carvings, a gift from Leah. The artist is Jutanee Attagutaluk of Arctic Bay. Hunter in Qayaq - Caribou antler, Seal Skin & wood. A couple of people have shown an interest in Inuit Art, so I thought I'd put up the odd picture of our collection from time to time. Here is the newest carving. The Artist is Bobby Levi, and he is fairly new at the game, and to be honest I haven't liked a lot of his stuff yet. However I quite enjoy this carving. Bowhead Vertebrae with inlaid stone eyes.